Hatha Yoga refers to a set of physical exercises known as postures or asanas designed to unblock energy channels in the body and let energy flow freely. It is a powerful tool for physical and mental transformation. This class is mixed levels and beginners are welcome. 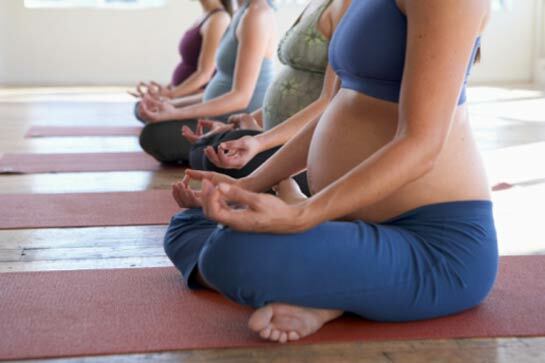 Pregnancy yoga, is a specially tailored form of yoga that is safe and beneficial to practice while pregnant. Practicing pregnancy yoga is one of the best things you can do for you and your baby. It will help you prepare your mind and body for pregnancy and for childbirth. Baby Massage is a wonderful way to spend time enjoying your new baby and deepening your bond. Nurturing touch has been proved to have a significant positive and lasting effect on babies. On this five week course you will learn how to massage your baby from head to toe. You will also learn a separate short tummy routine that can give very effective relief for discomforts like wind, constipation and colic. Mum and Baby Yoga is tailored to suit the need of women who have recently given birth and their babies. The class is suitable to begin after your six week check up, or after ten weeks if you have had a c-section. We focus on postures that work on restoring core and pelvic floor strength, realigning the pelvis, relieving low and upper back aches and tightness and generally increasing strength, stamina and fitness. Claire’s pregnancy yoga classes have been a god send. Claire is warm and friendly and makes everyone feel so at ease. The focus on stretching breathing and relaxing makes it such an enjoyable class and she is sensitive to the various medical needs of the class. Claire knows that everyone has their own pregnancy history and unlike other pregnancy classes that cram students into a small room Claire has a smaller class and this allows for individual attention as well as the class to get to know each other and discuss common issues. Claire never puts pressure on you to complete a move you may not be comfortable doing and is so knowledgeable about pregnancy generously sharing her information and interesting articles she has on the topics. Her humour and gentleness are hugely appreciated by all in our class and I look forward to more classes. Thanks so much Claire –you really do make a difference. Myself and my little guy loved baby massage with Claire. She created such a supportive social environment that relaxed all the mums and babies. The classes were easy to follow, informative and I always looked forward to the cuppa and homemade treat at the end! It was what I needed as a new mammy, and didn’t even know. We have also used the massage for colic at home and has worked really well. Love pregnancy yoga, I look forward to it every week as its like my time with the baby and always feel so much more relaxed after. Claire is great and couldn’t recommend this class enough. I attended Claire’s Pregnancy Yoga class every week from 16 weeks and I couldn’t have done without it throughout my pregnancy. It was brilliant for body and mind. Claire is an excellent instructor & really passionate about what she does. I went to Claire’s pregnancy yoga class and I would highly recommend it. The stretches and breathing exercises really helped me at the early stages of labour and because I knew how to get through it, was able and better prepared to stay home longer before heading to Holles Street. Claire is a really super teacher, so helpful with recommendations and you can see she really cares about her class. Baby massage was great, Caleb enjoyed it and seemed to really relax him as he had nice long sleeps after the class. Met some fab mum’s too.